Imagine a gym where you arrive to a brand new perfectly balanced workout every time, where the trainers were there to help you out and tell you exactly what you have to eat, answering all your questions and tracking your progress. Imagine if this place was more fun than a standard gym, had a sense of community, played great music, had no queues for machines and its staff took an active interest in your fitness and goals. Its time to stop settling for the mediocre and start getting into shape, this is the Underground Fitness Bootcamp. Unlike standard gyms where you’re left to your own accord or given piffy little ineffective programs, our personal trainers set up balanced, challenging and extremely effective workouts for you to undertake. Your body will change fast as you subject it to the perfect mix of cardio, strength, plyometrics and just about every training method out there. They’ll also supply you with cutting edge nutritional information and support, and that’s why you are MUCH more likely to see results with us than anywhere else. No more messing around, its time to get into shape. New to training? No problem. This system has scalable exercises, which means beginners, intermediate and advanced trainees have different options. This means you can progress your fitness from crawling zero to sprint hero all in one place. We use modern training tools like kettlebells, tyres, TRX, ropes and a lot more to maximise your time in our workouts. The physical effects of training like an athlete can be astounding. As you become stronger and fitter your body will change dramatically. Paul’s done it, so can you. 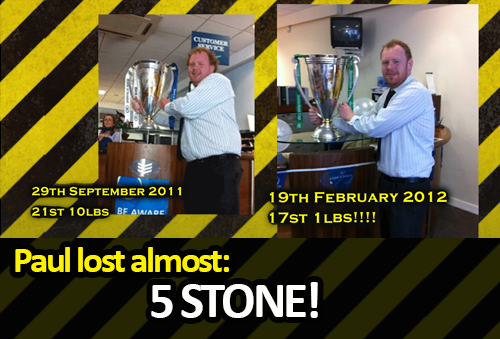 He changed his life attending just 3 of our workouts a week while following our metabolic meal planning from MetabolicEffect.com. 80% of any battle to change your body composition is fought in the kitchen. You are what you eat. At Underground Fitness we provide you with a full Metabolic Nutrition Program to burn maximal fat fast and build and define new lean muscle. 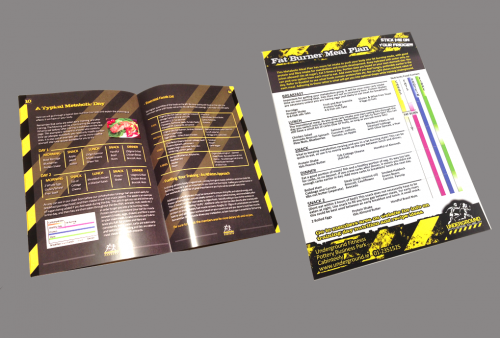 You will receive our Read-2-Get ripped Nutrition Booklet and A4 Metabolic Meal Plan to stick on your fridge. We use the metabolic nutrition principles of MetabolicEffect.com (the American industry leaders in fat loss) to achieve astounding physical results in a short time. No more calorie restricted diets or will power, our programs involve eating lots of food with the occasional treats. The old way of dieting is dead and ineffective but still largely thought, at Underground Fitness we eat to become athletic, lean and muscular. This is how true toning is achieved. 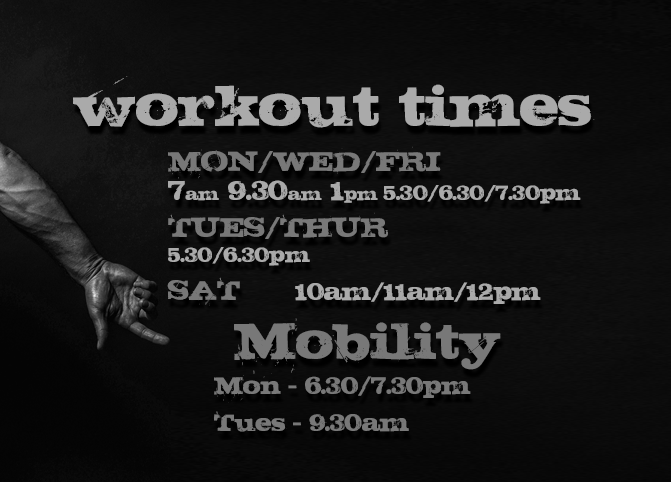 As a member of the Underground you can attend as many of the 24 workouts we stage a week as you want (or can). You will have access to our nutritional and training information, including the Read-2-Get Ripped Guide and Meal Plan, as well as on-going support from our instructors. This is a community, and we are here to help you on your journey. We also offer discounted rates for private fitness tutoring and nutritional counselling if you need an extra push. Just as important as how effective our training system is for your body is just how fun it is to take part. This is hard training, it has to be to be effective, but that doesnt mean you cant have a truelly enjoyable experience challenging your body and your mind. Push yourself to your limit and see what you’re capable of. This no ordinary gym or bootcamp, this is the Underground. Well its pretty easy, just click on the FREE TRIAL WORKOUT icon above to come down and check us out. Everyone is entitled to one so its the best way to start. If after your trial you decide to join you can sign up in our gym before your second workout! If you are eager to commit, you can click on the UG Membership (€75) link above to go to straight to our sign up page. The Clean Start Package and PT Introduction Package requires you to make contact with us, so clicking either of these links will bring you to our contact form.